The scapula (shoulder blade) and shoulder work as a singular unit that serve to move the arm through space. Due to its ball-and-socket joint structure, the shoulder can move through tremendous ranges of motion in daily life and even greater ranges in overhead sports like baseball and volleyball. Due to its osteomorphology, smooth and efficient movement of the shoulder is only possible because of the tightly coupled coordination of the deltoid (shoulder) and rotator cuff (scapular) muscle groups (Inman, Sanders & Abbot, 1944).As such, any deviation in function of the shoulder or scapula will create aberrant shoulder mechanics. Shoulder impingement (SIS) is a common condition usually attributed to compression of the rotator cuff against the undersurface of the acromion. There are two different types of SIS, primary and secondary. Primary SIS means that the impingement itself is the underlying issue. 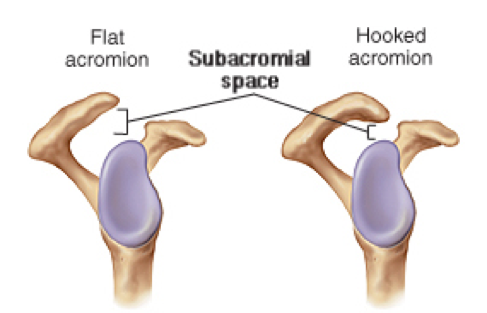 A hooked acromion (see below) is a perfect example of the former. Secondary SIS refers to an external issue that elicits impingement. This can include muscle imbalances, posture, or activities that displace the head of humerus (ball) from its centralized location on the glenoid (socket). These conditions are likely caused by weakness in the rotator cuff. Normally, the rotator cuff muscles work to keep the humeral head centered on the glenoid. Therefore, rotator cuff weakness creates a disparity in strength between the deltoids and rotator cuff, causing a shift in humeral head position, and therefore creating SIS. Here are a few exercises to help strengthen the rotator cuff to keep the shoulder healthy. 1. Pushup Plus – Start with a standard pushup, then press chest up towards ceiling, trying to flatten the shoulder blades at the top. 2. Prone Y Raise – With straight arms and palms neutral, squeeze shoulder blades and lift arms. 3. DB Side Lying External Rotation – Lay on side, bend elbow to 90°. Squeeze shoulder blade and lift hand towards ceiling. 4. Full Can – With palms neutral, squeeze shoulder blades and lift arms at 45° to shoulder height. 5. DB Row – Palms in neutral grip, squeeze shoulder blade, and pull weight to hip.